Hooray for Hollywood! That’s what I say! Because the fun, drama and suspense now begins! Oh – and the singing too! Did I mention the singing? 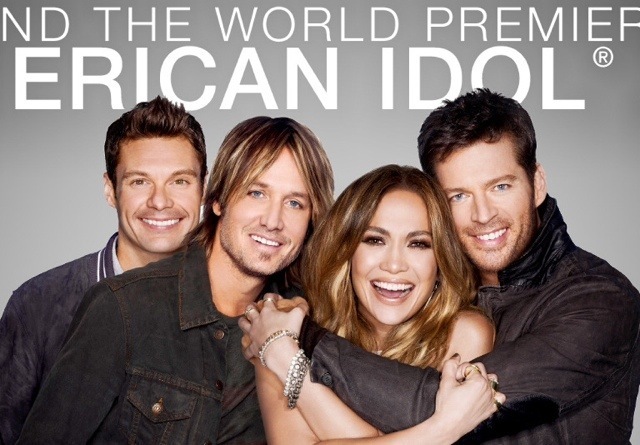 But Hollywood Week on American Idol has always been a favorite of mine. This is where we get a glimpse of the true personas behind some of the contestants – if we truly believe all we see and hear. There is this neat trick called editing that can somehow throw light or darkness on some of the singers depending on what the producers have in mind. Hey – I am just about the singing. Get on stage and sing – move me and inspire me! This is what I feel makes a difference in the singer’s success on this show. Personality counts for a great deal, but, at the end of the day, there has to be a fabulous voice that harmoniously walks hand in hand with the singer. Those who prove they have what it takes to move forward in the competition think they are headed to the “Hollywood” round. But, even before they unpack their bags, the contestants will learn they must compete in a surprise “Hollywood or Home” round, airing on Wednesday, Feb. 5 (8:00-10:00 PM ET/PT). In this intense new round, the judges will decide if these hopefuls really are committed and talented enough to become the next singing superstar. Some of the singers will be asked to perform one more time for the judges – and for some, this will be their last performance. It’s a tough decision for the judges, but even tougher for the contestants, because those who don’t make the cut must head straight home. The “Hollywood” rounds continue Thursday, Feb. 6 (8:00-9:00 PM ET/PT) and Wednesday, Feb. 12 (8:00-10:00 PM ET/PT), as the hopefuls take the stage of the Dolby Theatre in Los Angeles for group and solo performances. On Thursday, Feb. 13 (8:00-9:00 PM ET/PT), the Hollywood rounds end with a new twist as the Top semi-finalists are revealed. Here is a teaser video for Wednesday’s show. Enjoy! Comment away! Grrr! I loved the kid that sang first in the hanger (Johnny Newcome(?)) And they sent him home…alot of great guy voices this year! Watching it now Vonnie. Fox blanked out at 8:00 Eastern in my area. My turn to grrrr !!! IMO, the ORIGINAL elimination process was the best. I need go all ‘Smaug’ on AI. I just read that The X Factor has been canceled and Simon Cowell has returned to the UK’s X-Factor. When I look back to the first year’s of Idol with Simon as a judge, I think he contributed to the culture of bullying that is so rampant in our country. He made it perfectly acceptable for people to make nasty comments without putting a filter on whether the comment would be hurtful. I say good riddance to Simon from American TV.